A powerful new database enable scientists' research into man's origins. 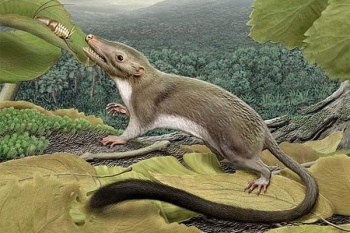 Using a new database of genetic traits, a group of scientists have discovered that humankind's most common ancestor with other placental mammals was a rat-sized animal with a long tail that likely lived on insects. Over the course of a six year study, the scientists built a model of the mammalian family tree that included a huge number of traits - like skeletal shape, teeth, internal organs, and fur patterns - and then used it to determine what a common ancestor possibly looked like. That ancestor came down to a fossil called Prontungulatum donnae, which was such an unloved creature that it didn't even have a common nickname, but turns out to be the creature that came before placental mammals, from elephants to human beings. The research included both genetic data from DNA and where in the fossil record a creature appeared to determine where in the family tree the creature resides. Dr. Maureen O'Leary, the report's principal author, told the New York Times that "The findings were not a total surprise, but it's an important discovery because it relies on lots of information from fossils and also molecular data. Other scientists, at least a thousand, some from other countries, are already signing up to use MorphoBank." MorphoBank is a publicly accessible database of genetic traits and morphology. It's a great tool for scientists, including both data and images of living and extinct animals. Compiling data, for example, allowed the scientists to recognize that Protungulatum had a two-horned uterus and placenta where maternal blood came in contact with the membranes surrounding the fetus - just like in humans - allowing for live births. MorphoBank enabled the scientists to compare over 4,500 traits. Some paleontologists disagree with the new date that this discovery puts on the rise of placental mammals, some 66 million years ago. A Duke University scientist, Dr. Anne Yoder, disagreed with the findings, saying that the researchers "devoted most of their analytical energy to scoring characteristics and estimating the shape of the [mammalian family] tree rather than the length of its branches." Nevertheless, Dr. Yoder did acknowledge that the study offered "a fresh perspective ... drawn from a remarkable arsenal of morphological data." The divide between paleontologists and geneticists on the rise of mammals is widely acknowledged. The study was published in the February 8th issue of the journal Science.